One of football’s greatest upsets wasn’t just a win for the ages, but a culmination of an endless uphill climb for a bruising running back from Napoleonville, Louisiana. 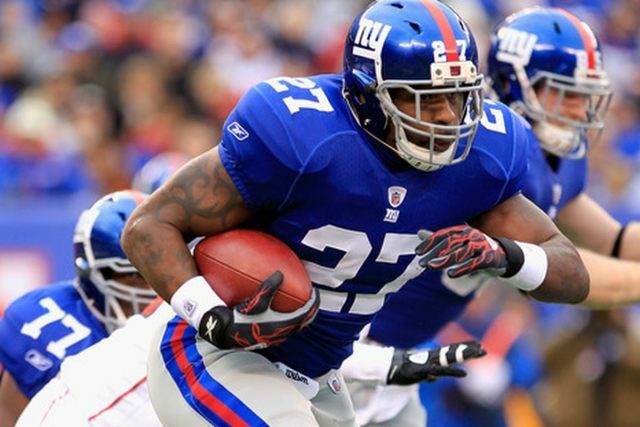 Before rushing for 1,009 yards and converting a crucial fourth down in the 2007 Super Bowl, Brandon Jacobs started playing football in his home state of Louisiana when he moved in with his aunt, who signed him up because she thought it would be best for him. Jacobs continued to play and it eventually grew on him. In his senior year of high school, Jacobs finished with 3,022 yards on the ground, with 38 touchdowns and averaging 8.6 yards a carry. Among his high school highlights are eight kick returns for touchdowns. His season earned him a spot on the USAToday.com All-American team. It was the grades that held him back, however. Even though Auburn had a great interest in Jacobs, he was short on credits to graduate, forcing him to attend Coffeyville Community College, where he pursued his high school diploma and associate degree. In his sophomore year at Coffeyville, Jacobs continued to roll with 1,899 yards and 17 touchdowns. Finally, in 2003, Jacobs transferred to Auburn, where it didn’t take long to find himself buried on the depth chart by stouts Ronnie Brown and Carnell “Cadillac” Williams. 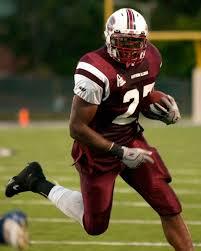 Jacobs still rushed for 446 yards and three scores before transferring to Southern Illinois University. After another solid year of college football, Jacobs was selected by the Giants with the 110th pick in the fourth round of the 2005 NFL Draft. Jacobs worked to emulate one of his idols to make sure that he made a great first impression. After sitting behind Tiki Barber for his first two seasons, Jacobs put his refined style to the test. Jacobs wound up running for 1,009 yards and four scores bringing his career touchdown total up to 20, 36 away from the Giants’ team record. 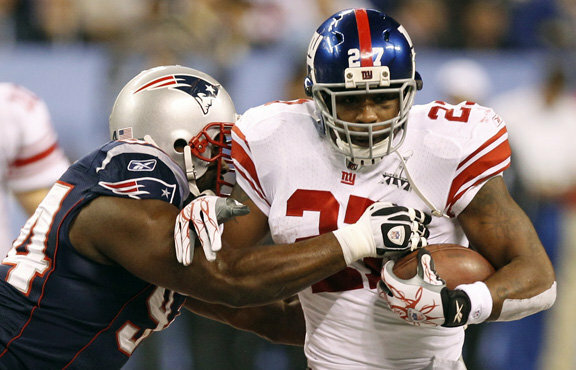 With Jacobs’ imposing running style, the Giants trudged their way to a 10-5 record before meeting the 15-0 New England Patriots in the final game of the 2007 season. Jacobs logged 67 yards rushing and the team had the unstoppable Patriots on the ropes but weren’t able to pull it off. They wound up losing 38-35 and finished 10-6, while the Patriots finished with a perfect regular season. Come the 2007 Super Bowl, it was the Giants and Patriots face-to-face once again. In the locker room, Jacobs and his teammates made a promise to each other; they would this time keep their foot on the gas pedal. Though the team kept repeating that phrase from the top on down, things weren’t looking great when Patriots quarterback Tom Brady tossed a touchdown pass to Randy Moss, leaving the team down 14-10 with just under three minutes to play. Eli Manning and the Giants took the field and on fourth down and one, gave the ball to Jacobs. Just like his fight through life, Jacobs battled to get his right arm across the line to gain. 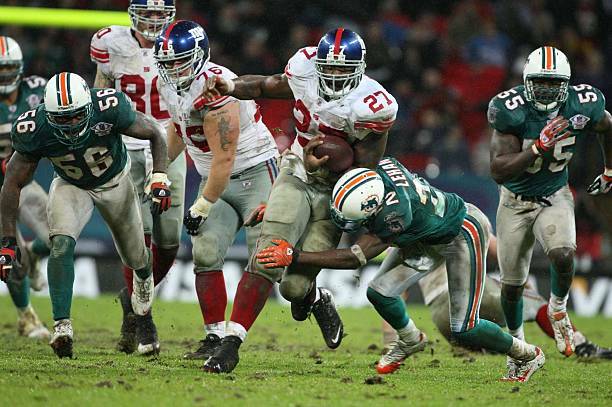 The conversion gave the Giants life; three plays later, came David Tyree’s “helmet catch.” Two plays later, Manning found an open Plaxico Burress for the lead and the game-sealing touchdown. When the triple zeroes hit the clock, Jacobs didn’t know what to do. As the seasons went by, accompanied with winning another ring in 2011, Jacobs was a touchdown machine. He added 15 more in 2008, and then five, and then nine more. In his last season with the Giants before leaving for San Francisco, he recorded another seven. It gave Jacobs 56 career rushing touchdowns and the all-time rushing touchdown record. Tiki Barber had 55. Jacobs would have one more year with the Giants, in which he recorded four more touchdowns, bringing his total up to 60. While he’s proud to have left a legacy, Jacobs has no doubt that it will be held by someone else in the future. One of those candidates to beat Jacobs’ touchdown mark is former No. 2 overall pick, Saquon Barkley. Jacobs has gotten a chance to speak with the young back and has offered Barkley advice. Today, Jacobs spends his time coaching football in Atlanta, teaching kids all levels of football, from Pop Warner to high school. 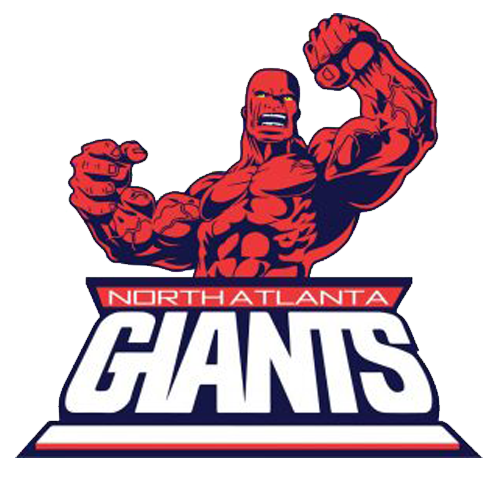 Jacobs also runs his own youth football program for kids ages 7-12 named the North Atlanta Giants as a nod to his playing days. In an area where there are many different programs available to youths, Jacobs hopes to make his football program more popular despite the odds being stacked against him. Jacobs says his program is more than just getting the kids out to play; it’s also about teaching key fundamentals, something other programs don’t offer. Jacobs is no stranger to odds being stacked against him, and he hopes to teach the kids how to be competitive, keep their heads up, and learn to play the game the way it’s supposed to be played in his life after football.